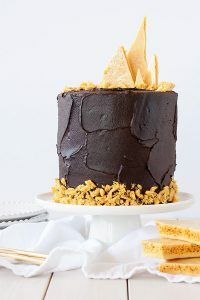 Dark Chocolate Honeycomb Cake – a rich chocolate layer cake recipe with ultra dark, fudgy frosting and homemade honeycomb. 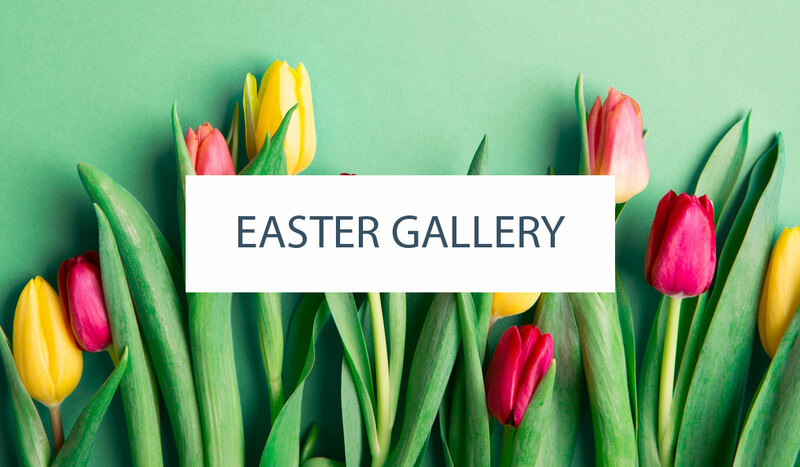 Created by our contributor, Olivia Bogacki. It’s (almost) officially Fall, and I am one happy camper. 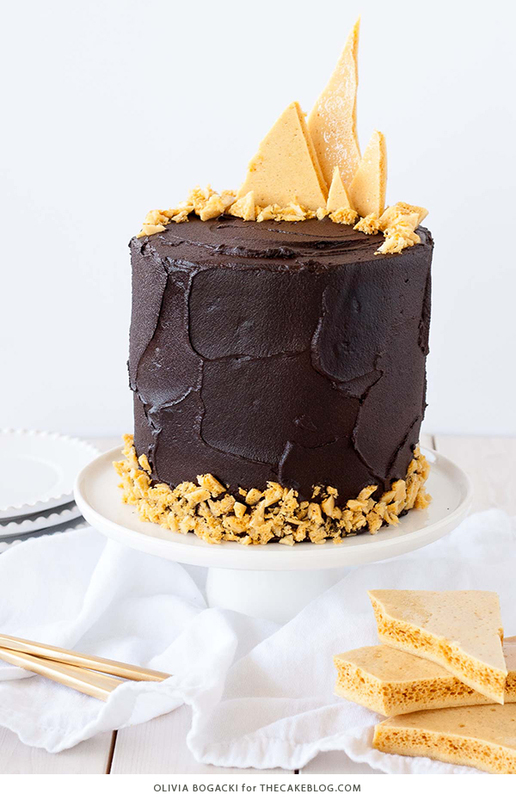 I kicked off Fall a bit early last month with my Apple Pie Cake and I’m keeping that theme going with this moody Dark Chocolate Honeycomb Cake. 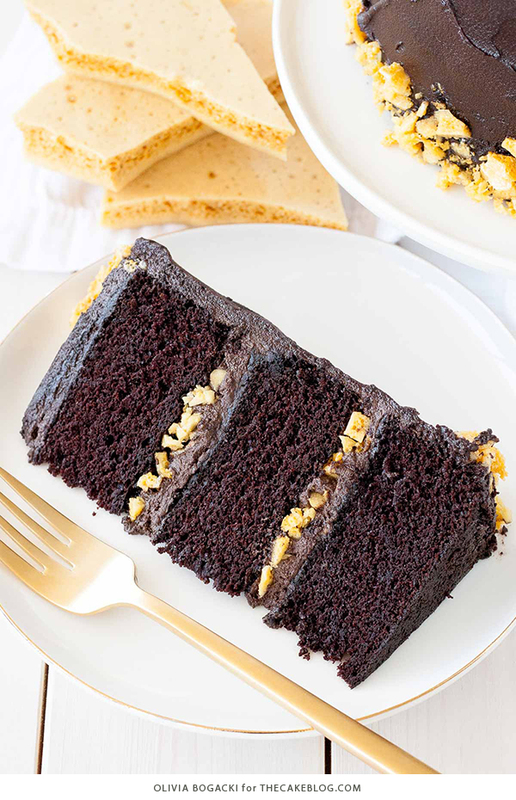 To me, chocolate cake is the ultimate comfort food. Perfect for those cold months when you’re curled up under a blanket by the fire. Is there anything better?? I will take my cozy sweaters and chocolate cake over shorts and ice cream any day. 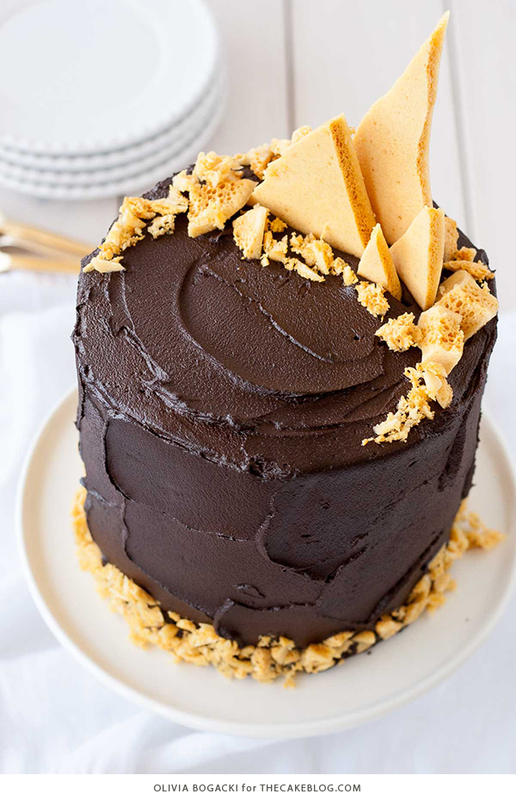 This Dark Chocolate Honeycomb Cake is the best chocolate cake I have ever had, and I’m not even kidding you. That frosting is seriously to. die. for. Fudgy sweet deliciousness. It’s loaded with two types of cocoa as well as melted dark chocolate for that extra rich color and flavor. I like to use black cocoa for the extra dark color, but if you don’t have any, you can just leave it out or replace it with regular cocoa. 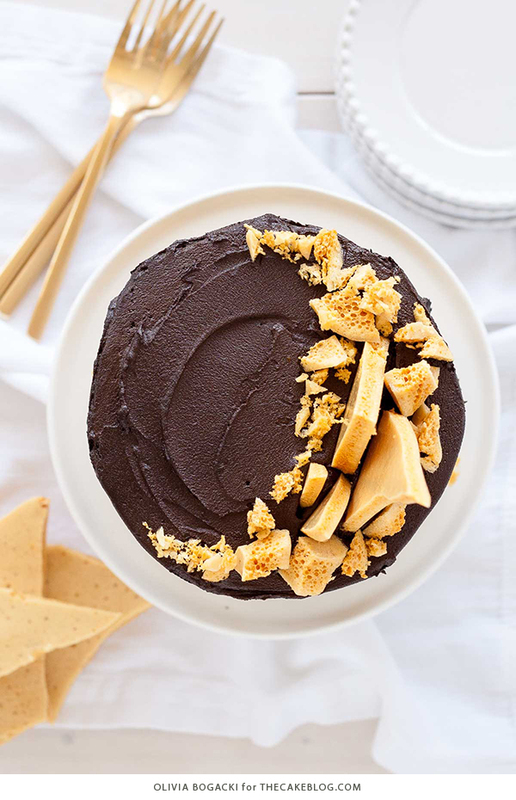 I chose to pair the chocolate on chocolate cake with some homemade honeycomb for both texture and color. I love that contrast! WHAT ABOUT THE HOMEMADE HONEYCOMB? Honeycomb is actually ridiculously easy to make. A few simple ingredients and you’ve got yourself a sweet, crunchy, airy treat. I used a candy thermometer in making mine, but you could just eyeball it if you’re feeling adventurous or don’t have one. Once the caramel starts turning the lightest shade of yellow, take it off the heat and whisk in the baking soda. Chances are you won’t get the perfect color every time, but the flavor and texture should be there regardless. I made the honeycomb twice, as I wanted both thicker and thinner pieces (read: my first batch was too thin so I made another, but ended up using both). Next time I’d just make one thicker batch. The recipe below is for one batch. 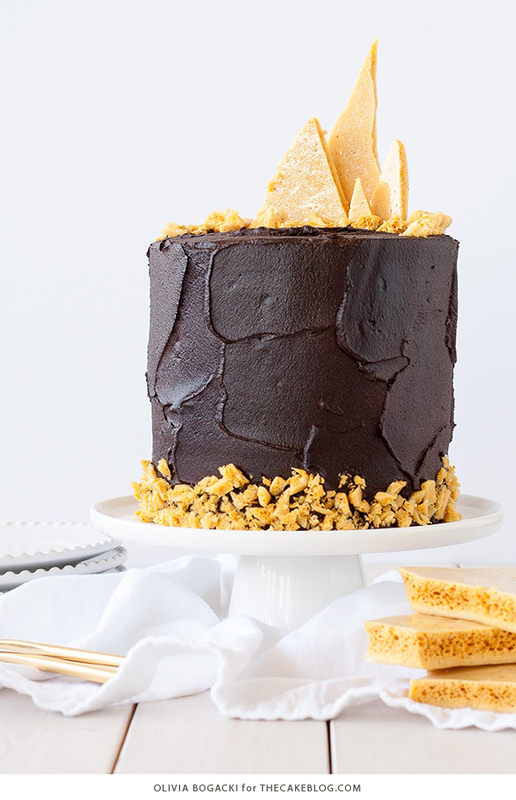 If you love rich, chocolatey desserts, this Dark Chocolate Honeycomb Cake will not disappoint! The perfect comfort food to get you through those chilly fall and winter days. Or, you know, Mondays. 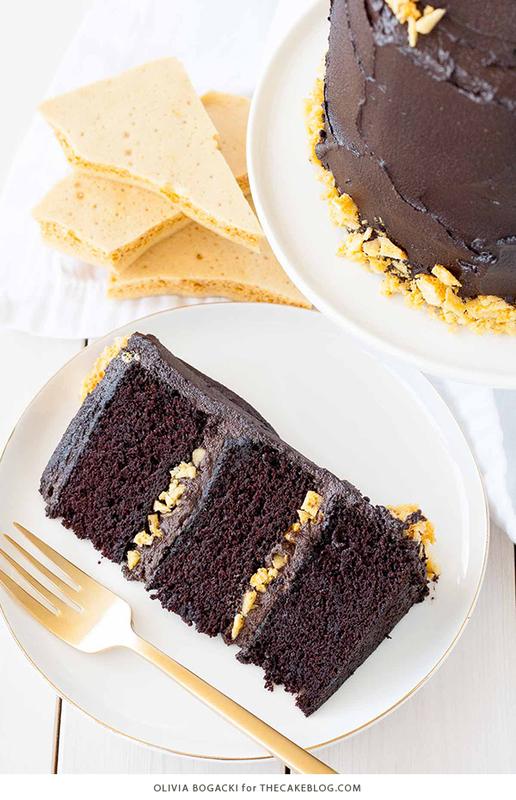 A rich chocolate layer cake recipe with ultra dark, fudgy frosting and homemade honeycomb. Preheat oven to 350F, grease three 6″ cake rounds. Dust with cocoa powder and line bottoms with parchment. Place flour, sugar, cocoa powder, baking soda, baking powder and salt into the bowl of a stand mixer. Mix until well combined. In a medium bowl, whisk eggs, oil, buttermilk, and vanilla. Very slowly pour in hot water while whisking constantly. Add wet ingredients to dry and mix on medium for 2-3 minutes. Batter will be very thin. Pour batter evenly into prepared pans. Bake for approx. 30-35 minutes or until a toothpick inserted into the center comes out mostly clean. Place the sugar, corn syrup, and water into a large saucepan. Stir well to combine and until the sugar is dissolved. Do not stir from this point forward. Wash down the sides of the pot with a pastry brush dipped in water, as needed, to prevent crystals from forming. Bring to a boil over high heat and cook till the temperature on a candy thermometer reads 300F (this will take about 10 minutes). 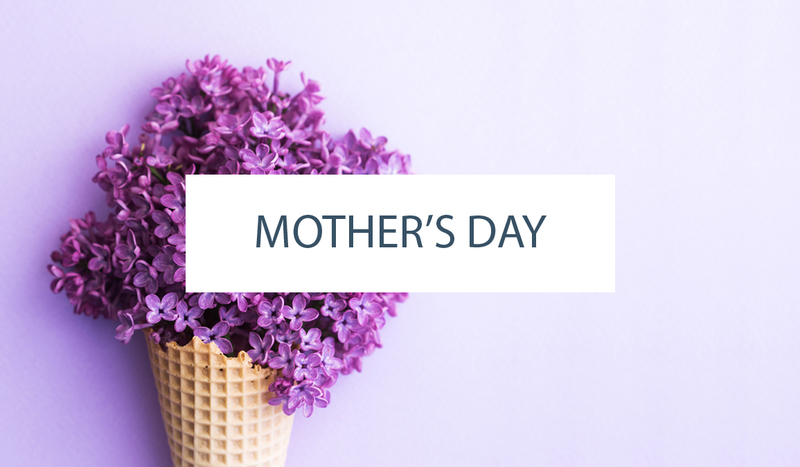 Remove from heat, sprinkle sifted baking soda over top, and quickly whisk it in. The mixture will foam up (it will grow about 4 times in size) and turn golden. Don’t over wisk or it will deflate. Just whisk enough to incorporate baking soda (max 5 seconds). Immediately pour into prepared pan and allow to cool (1-2 hours). Once cooled, use the tip of a knife to break into shards of desired size. Chop up some of the honeycomb into small pieces to add between the layers. Store any extra pieces in an airtight container, separated by parchment, at room temperature. In a medium bowl, whisk sifted sugar and cocoa powders to combine. In the bowl of a stand mixer, beat butter until smooth (1 minute). Add in sugar mixture 1 cup at a time, mixing well after each addition. Beat in melted chocolate. Add enough heavy cream until desired consistency is reached (I used 3 tablespoons). Place one layer of cake onto a cake stand or serving plate. Repeat with remaining layers and crumb coat the cake. Refrigerate for 30 minutes. Frost the cake sides and top with a rustic pattern. Place honeycomb shards along the top as desired. You can find tips for arranging them in this tutorial. For thinner honeycomb use a half sheet pan. I made the recipe twice and used both sized pans so I could have a variety of thicknesses of honeycomb. You will have a lot left over if you do this! Store any extra pieces in an airtight container, separated by parchment, at room temperature. The frosting will darken as it sits. Ensure the honeycomb pieces are fairly small or it will be harder to cut the cake, especially if chilled. 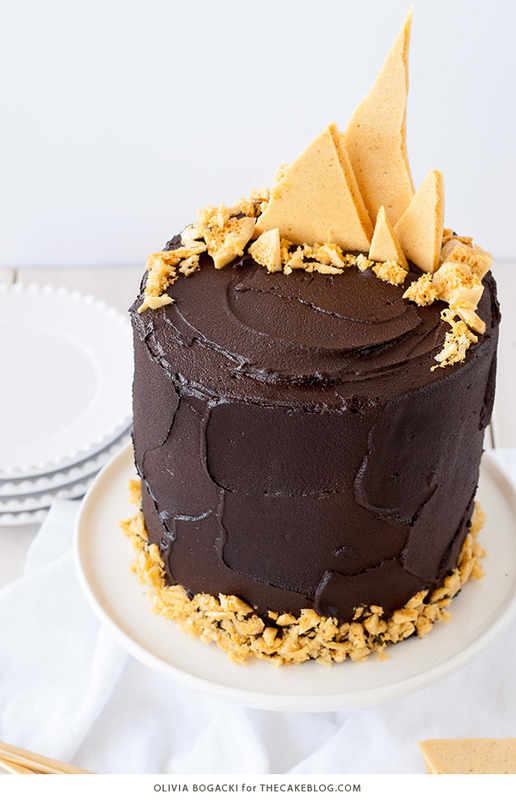 i recently had honeycomb on a cake and it was earth-shattering. yes. the honeycomb is crunchy but not hard, and it goes so well with tender cake. can’t wait to try this one out! Have you considered using molasses in the honeycomb? The lighter kind, not blackstrap. It would add a nice extra dimension to it, I think. Honeycomb candy made with it is one of my all-time favorites. I am considering making this cake, but in more traditional sized cake pans (9 inch). Would doubling the recipe do the trick do you think? Other than increasing the bake time… any other considerations I should give before trying this with 9 inch pans? I’m making this for a party so, of course I want it to be perfect, but I don’t want to do a practice cake! Hi Rebecca – this recipe would work for a traditional two layered 8″ round cake as well. Alternatively, you could bake intentionally shorter no-need-to-tort layers using three 8″ pans. When jumping up to a 9″ round pan, you’ll need more batter than this recipe creates. Doubling it will most likely give you a little too much for two 9″ round pans. Be careful not to overfill the pans as overflowing batter results in a messy oven and unevenly baked cake. Alternatively, you could probably do three intentionally shorter 9″ round pans with a double batch. Oh my goodness… Thank you so much!!!! What a helpful chart! I’ve never seen it before. I think I’m going to give it a go with three 9″ cakes by doubling the recipe. It’s okay it they’re a little thin. Thanks again for your help! Hate to be a pain….. but really hoping someone will respond to my question in the comment above! Thanks! Just made this for my son’s 2nd birthday – tonight was the test run and it tastes AMAZING! Hopefully the real thing will be just as good – he won’t care as long as there’s diggers on it! Hi Dani! The honeycomb will get stickier/chewier over time the longer it sits, especially if it’s refrigerated. I had it in the fridge for a couple of days and then freezer, but it never turned to syrup for me. The honeycomb between the layers started to stick together and it became more difficult to cut, so I recommend serving it same day. I hope that helps! does the honeycomb soften as it sits in and on the cake? Hi Cheshta! The honeycomb will get stickier/chewier over time the longer it sits, especially if it’s refrigerated. I had it in the fridge for a couple of days and then freezer, but it never turned to syrup for me. The honeycomb between the layers started to stick together and it became more difficult to cut, so I recommend serving it same day. I hope that helps! Can I replace corn syrup with golden syrup or sum thing else. Please can we have measurements in grams . Do you use a 6×2 or 6x3in pans? this is a curious concept! i’m wanting to try honeycomb in a layer cake with a pastry cream filling, but i’m worried. do you think the pastry cream will make the honeycomb soggy? Here is a handy conversion calculator for you! Hope it helps! I would love to be able to make this but I can’t see the instructions to make the cake. I can only see the honeycomb instructions twice. Please help! Sorry, there was a formatting issue with the printable recipe. It’s all fixed now. Happy Baking! SAme here, I am seeing double recipe on how to make honeycomb. Where is the cake recipe? Hi- I see the instructions for the honeycomb twice, but no instructions for the cake.